Purpose: The purpose of this study was to explore the predictive ability of factors associated with the Theory of Planned Behavior (TPB) on oral health behaviors. Methods: The participants of this descriptive, cross–sectional study were 179 first year medical students at the Carol Davila University of Medicine and Pharmacy that completed a questionnaire assessing TPB variables, self–identity and their current oral hygiene behaviors. Results: Significant differences in self–identity regarding the toothbrushing behavior and reason for the dental visit were observed (p<0.0001). When participants were classified in 2 groups according to their levels of self–identity, significant differences were found according to their age, toothbrushing frequency, attitudes, perceived behavioral control and intention for improving oral hygiene (p<0.0001). Self–identity had a statistically significant positive correlation with affective attitudes, cognitive attitudes, subjective norms, perceived behavioral control and intention for improving oral hygiene. Hierarchical multiple regressions for toothbrushing frequency revealed that the TPB factors and self–identity explained 31% and 35% from the intention to improving behaviors, the coefficients for self–identity being significant. 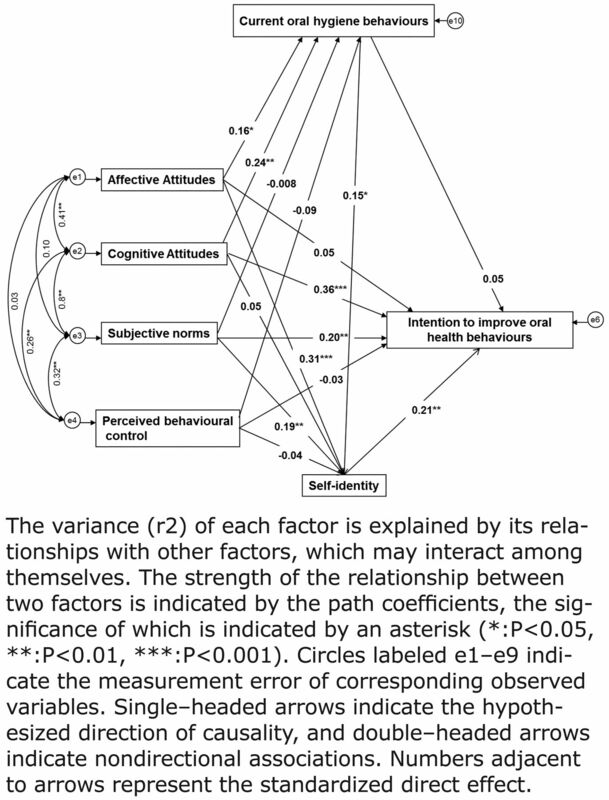 The structural equation model revealed the effect of self–identity on intention on improving oral health behaviors and the effect of past–behavior on self–identity. Conclusion: The findings revealed the value of the extended TPB model as a predictor of intention to improve oral health behaviors. Dental educators should focus on issues of students' self–identity as a person concerned by their oral health. According to the Theory of Planned Behavior (TPB), human behavior is guided by 3 kinds of considerations: beliefs about the likely outcomes of the behavior and the evaluations of these outcomes (behavioral beliefs), beliefs about the normative expectations of others and motivation to comply with these expectations (normative beliefs), and beliefs about the presence of factors that may facilitate or impede performance of the behavior and the perceived power of these factors (control beliefs). In their respective aggregates, behavioral beliefs produce a favorable or unfavorable attitude toward the behavior, normative beliefs result in perceived social pressure or subjective norm and control beliefs give rise to perceived behavioral control. In combination, attitude toward the behavior, subjective norm and perception of behavioral control lead to the formation of a behavioral intention. As a general rule, the more favorable the attitude and subjective norm and the greater the perceived control, the stronger should be the person's intention to perform the behavior in question.1 Thus, in reference to Ajzen's recommendations for the development of interventions based on the TPB, the next step is to investigate the determinants of intention and their related beliefs reflecting the cognitive foundation of the targeted behavior. The present study aimed to test an extended TPB, including self–identity, to predict young adults' intentions to engage in and subsequent engagement in improving oral hygiene behavior. It was expected that young people's level of self–identity regarding oral health would be associated with improved oral health behaviors (Hypothesis 1). It was also expected that attitude, subjective norm and perceived behavioral control (PBC) would predict intention to improve oral hygiene behavior, after taking into account the demographic factors of age, gender and past behavior, with the addition of self–identity expected to improve the prediction of intention (Hypothesis 2). Another aim of the research was to examine whether the effects of self–identity vary as a function of repeated experience of performing the relevant behavior. Specifically, it was proposed that the relationship between self–identity and intention would be strongest for people who had performed the behavior frequently in the past (Hypothesis 3). The participants of this descriptive, correlational, cross–sectional study were 179 first year medical students at the Carol Davila University of Medicine and Pharmacy who were invited to this survey at the beginning of the 2010 to 2011 academic year. Participants' mean age was 19.68, and the sample consisted of 142 women and 37 men. In addition, the sample was homogenous in terms of ethnic background (100% Caucasians). Upon entry, all participants signed a declaration of informed consent. The study was conducted in full accordance with the declared ethical principles (World Medical Association Declaration of Helsinki, version VI, 2002). The research data were gathered by means of a structured Romanian questionnaire. For the TPB constructs, 5 items were developed for each TPB domain based on the literature review and on Ajzen's TPB.4 A 7–point Likert–type and semantic differential scale was used to elicit participants' responses in each of the domains. All the variables were scored consistently so that higher mean scores reflected more positive attitudes, more positive subjective norms and higher perceived behavioral control towards oral health behaviors. The overall alpha coefficient of the instrument was 0.881. The behavioral intention measures asked participants to indicate how likely they were to engage in certain oral health behaviors on a regular basis and were measured on 7–point scales ranging from (1) extremely unlikely to (7) extremely likely. The intention items were: I will toothbrush my teeth more than twice per day, I will floss my teeth daily during the next month and I will use mouthwash daily. The Cronbach's alpha of the scale was 0.792. Five items assessed affective associations with oral health behaviors. Each item asked participants to report how they feel when considering regular toothbrushing, flossing, mouthwashes, dental visits and scaling frequency (unpleasant/pleasant). Participants responded using 7–point scales with 1 and 7 anchored by each end of the semantic differential. The Cronbach's alpha of the scale was 0.675. The mean of the 5 items served as the measure of affective attitude. Attitudes toward oral health behaviors were measured with 5 items assessing the expected value of engaging in regular oral health behaviors. Each question consisted of a semantic differential (harmful/beneficial) anchoring each end of a 7–point response scale following the prompt, “For me, performing the oral health behavior (e.g. floss my teeth daily) on a regular basis is …” The mean of the items served as an overall measure of cognitive attitudes (alpha=0.725). One question for each behavior, measured by 7–point scales, assessed subjective norm: e.g. “Most people who are important to me would wish that I performed the oral health behavior (e.g. floss my teeth daily)” (disagree completely/agree completely). The mean of the items served as a measure of social norms (alpha=0.907). For each behavior, PBC was assessed by 4 indicators, all measured by 7–point scales. One item made reference to how easy or difficult performance of the behavior was perceived to be: “For me is difficult to perform the oral health behavior (e.g. floss my teeth daily)” (disagree completely/agree completely). One question measured how confident the respondent was that he/she would be able to successfully perform the behavior: “If I wanted to, I would not have problems in succeeding to perform the oral health behavior (e.g. floss my teeth daily)” (disagree completely/agree completely). One item was phrased to reflect perceived control: “I have full control over performing the oral health behavior (e.g. flossing my teeth daily)” (disagree completely/agree completely). Finally, one item was of the locus of control type: “It is completely up to me whether or not I perform the oral health behavior (e.g. floss my teeth daily)” (disagree completely/agree completely). The mean of the items served as a measure of PBC (alpha=0.752). Past oral health behavior was assessed with a single item for each personal oral (home) care (e.g., frequency of tooth brushing, frequency of dental flossing, frequency of use of mouthrinse) and professional dental health care (e.g., frequency of dental visits or reasons for last dental visits): “During the last month how many times have you used dental floss?” (1=not at all, 5=every day). Two items assessed the extent to which performing the oral health behaviors is an important part of an individual's self–identity, e.g. “The oral cavity and dental health are an important part of who I am” and “I think of myself as someone who cares about his dental health,” scored from 1 (no, definitely not) to 7 (yes, definitely). The mean of the items served as a measure of self–identity (coefficient alpha=0.712). A higher score indicated greater identification with the role of a person concerned by their oral health. Two levels of self–identity were defined through use of a median split. For each construct, there were very few missing values, with 98.99%, 99.77% 99.66%, 100%, 99.57% and 100% of respondents providing responses to all items measuring affective attitude, cognitive attitude, intention, subjective norm, perceived control and self–identity, respectively. In the few cases where missing values were encountered, those who provided no response to any of the items for the various constructs were excluded from analyses. The final study group included 165 students. To provide an estimate of the internal consistency among items in the respective scales, Cronbach's alpha values were calculated. Discrete variables were compared with Fisher's exact test and were presented as percentages. Continuous variables were presented as mean±SD and compared with the Student t–test. Means, standard deviations and Pearson's correlations were computed between the study variables. Hierarchical multiple regression models were fit using a planned stepped approach to control for confounders and explore the relationship of predictors (attitude, social norms, perceived behavioral control and self–identity) to intention to improve oral health behaviors. Principal component analyses (with varimax rotation) supported the empirical distinction among the variables. In the performed analysis, which accounted for 72.9% of the variance, the items assessing self–identity and each of the predictors of intention outlined by the theory of planned behavior (attitude, subjective norm and perceived behavioral control) loaded on separate factors. All tests were 2–tailed. A p–value<0.05 was considered to be statistically significant. All statistical analyses were performed using SPSS 17.0 for Windows. Structural equation modelling was used via AMOS 7.0 (SPSS, Inc.) to predict intentions to perform improve each of the behaviors. Maximum likelihood was used to estimate the parameters of the model. Model fit was determined by the following indicators: chi–squared test (non–significant or acceptable if no more than 3 times the degrees of freedom), comparative fit index (CFI) (>0.90), goodness–of–fit index (GFI) (>0.90), Tucker–Lewis index (TLI) (>0.90), Bentler Bonett normed fit index (NFI) (>0.90), standardized root mean square residual (SRMR) (<0.05) and root mean square error of approximation (RMSEA) (<0.08). Path coefficients and R2 values were also inspected to evaluate the predictive power of the model. Results are presented in several steps. First, comparisons of self–identity levels according to current oral health behaviors were performed. Also, participant characteristics stratified by self–identity level were analyzed. Second, correlations between attitude, intention, subjective norm, perceived control and intention to improve oral health behaviors were reported. Third, complex inter–relationships amongst the study variables were analyzed by hierarchical multiple regressions. Finally, the results of structural equation modeling of the complex inter–relationships among the study variables are reported. Significant differences in self–identity regarding the toothbrushing behavior and reason for the dental visit were observed. The students who brushed their teeth more than twice a day scored significantly higher (6.55±0.74) compared with those participants who brushed their teeth once a day or less (5.64±1.46) (p=0.004). Participants who visited their dentist only when pain reported lower levels of self–identity (5.62±1.47) compared with those who visited the dentist when treatment was needed (6.35±0.87), for regular scaling (6.44±0.91) or for check–up (6.35±0.84) (p=0.01). When participants were classified in 2 groups according to their levels of self–identity, significant differences were found according to their age (19.18±1.01 vs. 20.21±4.17, p<0.05), toothbrushing frequency (p=0.005), affective attitudes, cognitive attitudes, perceived behavioral control, subjective norms and intention for improving oral hygiene (p<0.0001) (Table I). As expected, young people's level of self–identity regarding oral health was associated with improved oral health behaviors (Hypothesis 1). Prior to conducting the regression analyses, correlations among the predictors were computed. Self–identity had a statistically significant positive correlation with affective attitudes, cognitive attitudes, subjective norms, perceived behavioral control and intention for improving oral hygiene. The other components of the model were also significantly correlated with each other (Table II). The range of significant correlation values was found to be from 0.16 to 0.38, depending to the type of oral health behavior analyzed. Several hierarchical multiple regression analysis predicting intention to improve each oral health behavior were conducted to determine if self–identity emerged as a significant predictor after control of the components of the TPB and past behavior (Table III). The effects of past behavior were controlled in all analyses because of consistent evidence linking past behavior to intention. For tooth brushing frequency, the step 1 variables of age, gender and past behavior significantly accounted for 8% of the variance (F=4.79, p=0.003). The addition of the step 2 variables of attitude, PBC and subjective norm increased the proportion of variance to 31% (F=10.16, p<0.0001). For step 3, the addition of self–identity accounted for a further 4% of variance, with the full model accounting for 35% of the variance (F=10.53, p<0.0001). When all variables were entered into the equation, of the significant predictors, cognitive attitude had the largest beta weight, followed by subjective norm and self–identity. As predicted under Hypothesis 2, participants were most motivated to improve their oral health behavior if the behavioral role was important component of their self–identity. The last set of analyses investigated the effect of past behavior on the self–identity–intention relationship. The initial model (Figure 1) was verified using the AMOS technique. The model was modified based on an inspection of the analysis of the initial model, after which the final model was constructed (Figure 2). The structural model included paths from TPB components and improving oral health behavior intention, correlations among the TPB predictors, the effect of current oral health behaviors on intention to improve oral health behaviors (tooth brushing more than twice per day, daily flossing, daily mouth washing, visiting the dentist on a regular basis and undergoing dental scaling on a regular basis), the effect of self–identity on intention and the effect of past–behavior on self–identity. Regarding the tooth brushing frequency, the final model fitted well with the whole sample: χ2=0.53 (df=2, p=0.76), GFI=0.99, CFI=1.00, RMSEA=0.00, TLI=1.09, NFI=0.99 and SRMR=0.009; 34.3% of the variance associated with improving toothbrushing frequency intention was accounted for by its 6 predictors. The hypothetical model was also tested separately among males and females. Goodness–of–fit statistics were significant between males and females. The model had a better fit among females (χ2=0.43 [d.f.=1, P=0.51], GFI=0.99, CFI=1.00, RMSEA=0.00, TLI=1.20, NFI=0.99 and SRMR=0.01) than among men (χ2=1.37 (df=1, p=0.24), GFI=0.98, CFI=0.99, RMSEA=0.10, TLI=0.91, NFI=0.98 and SRMR=0.05). The hypothetical model was separately tested for all personal oral home care (e.g., frequency of tooth brushing, frequency of dental flossing, frequency of mouthwash use) and professional dental health care (e.g., frequency of dental visits or reason for last dental visit). GFI statistics were significant only for tooth brushing frequency (Table IV). The present study aimed to test an extended TPB, including self–identity, to predict young adults' intentions to engage in and subsequent engagement in improving oral hygiene behavior. The cognitive attitudes and subjective norms of the TPB emerged as the strongest predictors of intentions to improve oral health behaviors. In contrast with previous studies employing the TPB to examine oral health behavior,19–25 subjective norms significantly contributed to the prediction of behavior. Strategies that aim to reduce problematic low levels of oral hygiene could emphasize that important people in an individual's life (e.g., family, friends, coworkers) would disapprove of their missing to engage in regular hygiene (subjective norm), reinforce the negative consequences (e.g., decays, bleeding, bad breath) associated with low level use (attitudes), and encourage people to strongly embrace the identity of an oral hygiene user (e.g. flosser), endeavoring to make personal and professional oral health behaviors important to their self–concept (self–identity). As expected, young people's level of self–identity regarding oral health was associated with improved oral health behaviors. However, the magnitude of the differences was fairly small, despite being statistical significant: a 0.9 point difference for brushing, and a 0.7 point difference for treatment, while the significant difference in age was also only 1 year. These differences could reveal a reduced utility and meaningfulness of the impact of self–identity on oral health behavior in this young study population. Younger individuals may not have a fully developed self–identity as it relates to oral hygiene. Erik Erikson's psychosocial theory revolutionized developmental thought as he was one of the first to propose a lifespan model of human development which included 8 successive psychosocial stages.26 It appears that for many individuals, identity development is a lifelong process that extends well beyond the years of adolescence (ages 12 to 24) as identity issues continue to emerge until middle adulthood (40 to 65 years).27 However, when participants were classified in 2 groups according to their levels of self–identity, significant differences were found according to their tooth brushing frequency, affective attitudes, cognitive attitudes, perceived behavioral control, subjective norms and intention for improving oral hygiene. One limitation of the study was the limited sample population of university undergraduate students in a health professions field with a large proportion of female participants that may limit generalizability of the results. However, the hierarchical multiple regressions evaluated the effect of gender as a confounder in the present study and structural equation modeling revealed that the model was adequate in both males and females. Finally, TPB may perform differently in different socio–cultural contexts, and it is therefore important to test the applicability of the TPB in different countries and also in older populations to strengthen the cross validation and theoretical veracity of the findings. The present study provided support for the application of the TPB model in the context of oral health behaviors. Self–identity as a person interested in his/her oral health had a statistically significant correlation with all components of the TPB. Moreover, participants with higher levels of self–identity reported also a better tooth brushing frequency and intention for improving oral hygiene. Thus, this added understanding of the roles that self–identity plays in the lives of young students can enhance the interactions of general practice dentists with their dental patients. Finding out if oral health identities are valid for a particular patient can help in tailoring practice in a patient–centered way and can provide the context for enabling these patients to incorporate their previous oral health behavior experience into the broader context of their dental health most effectively. Alexandrina L. Dumitrescu, DDS, BSc, MSc, PhD, works in private practice in Bucharest, Romania. Carmen Duţă, BSc, PhD, works at the Carol Davila University of Medicine and Pharmacy, Bucharest. Carmen Beatrice Dogaru, MD, PhD, works at the Carol Davila University of Medicine and Pharmacy, Bucharest. Bogdan Manolescu, BSc, works at the University Politehnica of Bucharest. This study supports the NDHRA priority area, Health Promotion/Disease Prevention: Assess strategies for effective communication between the dental hygienist and client.
. The theory of planned behavior and health behaviors. In: Predicting health behavior. Conner M, Norman P, eds. Buckingham, England: Open University Press. 1996.
. Efficacy of the Theory of Planned Behavior: a meta–analytic review. Br J Soc Psychol. 2001;40(Pt 4):471–499.
. Self–efficacy and reasoned action: Predicting oral health status and behaviour at one, three, and six month intervals. Psy Health. 1993;8(2–3):105–121.
. 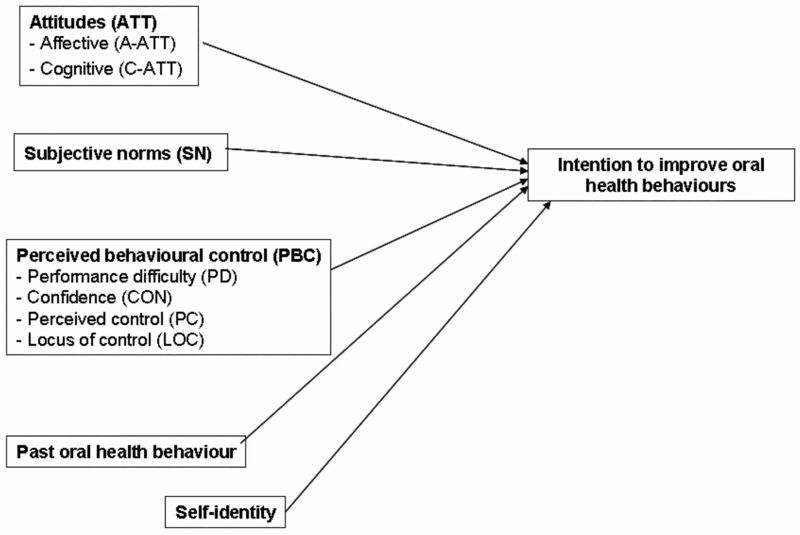 Modeling the theory of planned behavior for intention to improve oral health behaviors: the impact of attitudes, knowledge, and current behavior. J Oral Sci. 2011;53(3):369–377.
. Determinants of oral hygiene behavior in the Dominican Republic. Int Dent J. 2011;61(6):328–333.
. Determinants and promotion of oral hygiene behaviour in the Caribbean and Nepal. Int Dent J. 2011;61(5):267–273.
. Measuring oral health behaviour in Flemish health care workers: an application of the theory of planned behaviour. Community Dent Health. 2008;25(2):107–114.
. Factors influencing the use of public dental services: an application of the Theory of Planned Behaviour. BMC Health Serv Res. 2008;8:93.
. Understanding choice of milk and bread for breakfast among Swedish children aged 11–15 years: an application of the Theory of Planned Behavior. Appetite. 2000;34(1):5–19.
. Cigarette use by adolescents: attitude–behavior relationships. Subst Use Misuse. 1999;34(3):455–468.
. Reconceptualizing adolescent sexual risk in a parent–based expansion of the Theory of Planned Behavior. J Nurs Scholarsh. 2007;39(2):141–146.
. The theory of planned behavior. Organ Behav Hum Decis Process. 1991;50:179–211.
. Identity theory: Developments and extensions. In: Yardley K, Honess T, eds. Self and identity. New York: Wiley. 1987. 89–104 pp.
. The theory of planned behavior: self–identity,social identity and group norms. Br J Soc Psychol. 1999;38(Pt 3):225–244.
. Young adults' intention to eat healthy food: extending the theory of planned behavior. Psychol Health. 2001;16:223–237.
. Perceived chewing ability and intake of fruit and vegetables. J Dent Res. 2008;87(8):720–725.
. Investigating Multiple Components of Attitude, Subjective Norm, and Perceived Control: An Examination of the Theory of Planned Behavior in the Exercise Domain. Br J Soc Psychol. 2003;42(Pt 1):129–146.
. Modelling the theory of planned behavior and past behavior. Psychol Health Med. 2003;8(1):57–69.
. Predicting Physical Activity Intention and Behavior among Children in a Longitudinal Sample. Soc Sci Med. 2006;62(12):3146–3156.
. Extending the Theory of Planned Behavior in the Exercise Domain: A Comparison of Social Support and Subjective Norm. Res Q Exerc Sport. 2002;73(2):193–199.
. Comparison of Social Variables for Understanding Physical Activity in Adolescent Girls. Am J Health Behav. 2004;28(5):426–436.
. An Extended Model of Theory of Planned Behavior in Predicting Exercise Intention. Int Business Res. 2008;1:108–122.
. Determinants of oral hygiene behavior: a study based on the theory of planned behavior. Community Dent Oral Epidemiol. 2011;39(3):250–259.
. Erikson on development in adulthood: New insights from the unpublished papers. New York: Oxford University Press. 2002.
. Identity Development Throughout the Lifetime: An Examination of Eriksonian Theory. Graduate J Couns Psychol. 2009;1(2):Article 14.
. Norms, preferences, identities and retention decisions. Soc Psychol Q. 1987;50:322–337.
. Role identity and reasoned action in the prediction of repeated behavior. Soc Psychol Q. 1988;51:303–317.
. Understanding pedestrians' road crossing decisions: an application of the theory of planned behavior. Health Educ Res. 1998;13(4):481–489.
. An integrative theory of intergroup conflict. In: Austin WG, Worchel S, eds. The social psychology of intergroup relations. Monterey, CA: Brooks–Cole. 1979. 34–47 pp.